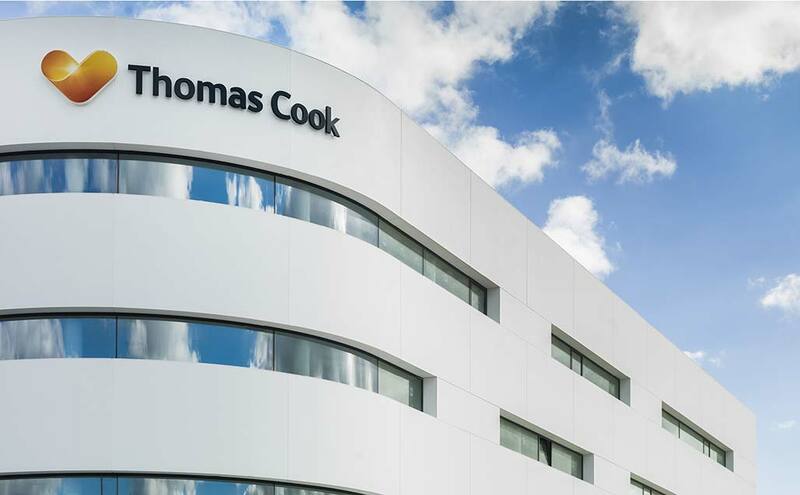 Thomas Cook Group began its operations in the world of leisure travel in 1841 with a train excursion from Leicester to Loughborough, and today serves 19 million clients travelling around the world. One of the most emblematic destinations for Thomas Cook is the capital of the Balearic Islands, Mallorca, one of the Spanish cities which receives the largest number of tourists each year. It is here that it has created its headquarters in which it has used PORCELANOSA Group to present the image of its spectacular facade. Three companies of the Group formed part of this project: URBATEK with X-Light large format porcelain tiles; BUTECH with the K-Bolt (KRION) anchoring system, HC Panel (X-Light) and the installation of the 1000m2 ventilated facade; and SYSTEMPOOL with the new generation solid surface KRION1100 Snow White. In this original facade, we can find large pieces of KRION, created by joining sheets without perceptible joins, and the thermocurved front where the name and logo of the company are incorporated.